Crunchy eggs? Ova my dead body. 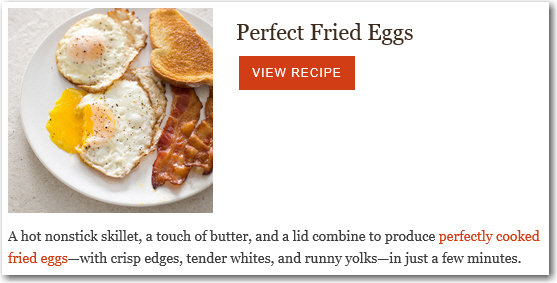 America’s Test Kitchen’s idea of the perfect fried egg – offered in their weekly recipe email this morning – differs from mine in one respect: I consider fried eggs with crisp edges to be partially burnt and, like a typical Starbucks roast, a bit unpleasant. I also disagree with their use of oil in addition to butter; I think it’s in there primarily so they can burn the edges but not the butter. Oil is also going to give you rather greasy eggs unless you pat them with a paper towel before serving. If I got such eggs at a diner, I’d cut the crunchy edges off and drop any daft plans I might have for a return visit. The same goes for scrambled eggs that look and taste like a pile of sunbaked boulders. Standards must be maintained. 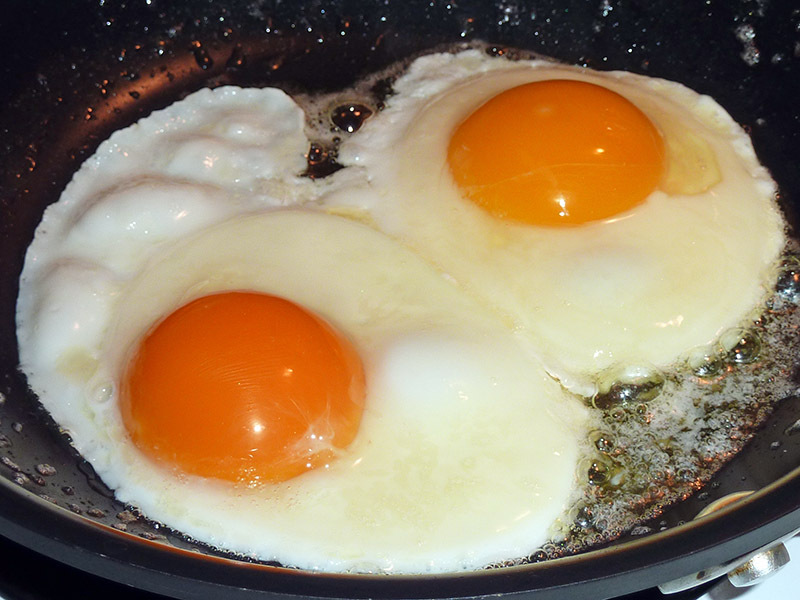 Below, my perfect butter-fried over-easy eggs in progress. All they need from this point is a flip of the wrist and another couple of minutes on medium-low heat. hummm. Have to have a think about this. A couple of things that I’m not so in favor of in your version…i’m strictly a sunnyside up gal…so that “flip and cook for a few more minutes “? Yikes ! Best fried egg technique I have ever seen was at a place called Marie-Ange’s somewhere in the very middle of France. The guy had only a fried egg on offer. No omelets. No ham nor cheese. Nothing else that I can remember. I’ll admit, though, that I simply cover the pan as soon as the eggs drop and use a slightly lower temperature than I do for over-easy. That’s a bit of overflow maple syrup at the edge, by the way, not a crunchy crust. The egg you described sounds great. Egad – that just may be the most perfect-looking breakfast I’ve ever seen! Yes those look yummy ! No not crunchy. And indeed the fact that he kept spooning the hot over the top meant that they were cooked on top too. Kind of a light film of cooked white on the top of the yolk. This is important i think. That and the little bit of vinegar which cuts the fattty feeling of the yolk in your mouth in the most delicious way. I think there are basically two ways to cook eggs. Very quickly or extremely slowly (in a slow oven). Butter will burn if i use the quick way. Might try indian frying technique and try ghee or clarified butter …a voir. ooo Butter ! We must have a butter conversation one of these days. Mom used to make butter when I was a kid with the top of the raw milk that she got from a friends farm most weeks. Here in France, we have a miraculous butter maker : “Bordier” that makes things like smoked butter and butter with seaweeds…he makes something like fiften different butters…last spring I ran into him at a salon where he was offereing butter tastings. Heaven on a spoon. I’d love to try some flavoured butters. I never have, so I don’t have a feel for what sort of flavoured butter you might use in particular dishes. Any examples of combinations? I always chuckle when I see sleb chefs like Ramsay do their special 15- or 20- or 30-minute scrambled eggs, the ridiculously long time, they claim, required for amazing scrambled eggs. What a load of buncombe. I don’t believe for 1 minute that they ever do that for anything but a TV audience. I love doing the exact same sort of creamy, soft, small-curd scrambled eggs they’re espousing with their fantasy recipes, but super fast – three or four minutes start to finish. I use regular unclarified butter for this, but it doesn’t burn because the butter goes in only seconds before the eggs. 2. Set a pan on medium-high heat. 3. While it’s hotting up, whisk your eggs – I use three eggs, salt, pepper, and a tablespoon of cream. The cream lends a nice silkiness to the interior of the finished scramble. Start your toast. 4. When the pan’s hot, toss in a butter pat (a teaspoon or so), quickly swirl it around, then just when it’s melted, in with your eggs so the butter doesn’t burn. 5. 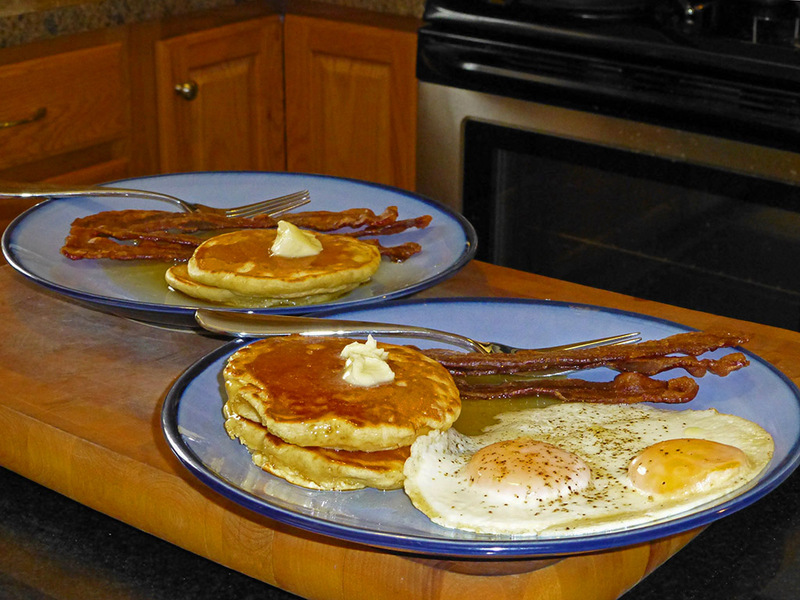 Use a small whisk – with silicone-coated wires if you use a non-stick pan as I do – to keep the eggs moving constantly. This keeps the curd size small and prevents the eggs from drying out on the bottom. 6. In about 70 seconds (if I recall correctly), when they’re still quite soft and a little wet – or, a little before you see your preferred texture – get them off the heat. 7. Immediately stir in a tablespoon, more or less, of sour cream – or crème fraîche if you’ve got it – to halt the cooking and add a pleasant slight tang. Transfer to your warmed plate. gosh. makes me want to run out and buy some eggs ! My speedy scrambled eggs are shown in a new post here: 70-second eggs.